A Marquise au Chocolat is a completely decadent, very rich chocolate mousse which I first tasted when I stayed in France as a teenager and I loved it. It was made for me by my hostess, Chantal, Vicomtesse de la Salle and I have never forgotten it. This is a beautiful desert to serve at a festive dinner. I found a recipe in my traditional Good French Food cooking book by Mapie, Comtesse Toulouse Lautrec which I adapted slightly. It is not too difficult to make but I found it quite messy and ended up with chocolate all over me (which was very tasty). I added some fresh berries to decorate the desert when I served it, I found their tartness balances the richness of the mousse and they create a beautiful colour pattern on the white cream. Cut up the chocolate into small squares, place in a double boiler (or a bowl over a saucepan of warm water) and gently melt the chocolate turning with a wooden spoon until all the pieces are melted. Remove from heat. Stir in the sugar then the butter into the melted chocolate. Mix together thoroughly. Separate the eggs into different containers. Add 1 egg yolk at a time into the chocolate mixture stirring well each time. Fold into the chocolate mixture with a spatula. Lift the mixture as you mix it in, to get plenty of air in it, until the whites are fully mixed in. Add the cognac and mix in well. 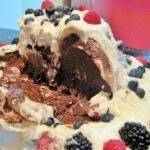 Use a large, round based pudding bowl to make the shape of the desert. Line the inside of the bowl with cling wrap or grease proof paper (which can be easily removed once the desert has set). Pour the chocolate mixture into the bowl and place in the fridge for several hours to set. I do this the night before if I have time. Turn out the desert onto a large round, flattish serving dish with a slightly raised edge in case the creams drips over. Remove the lining around the pudding and smooth the edges with a knife blade if it’s a uneven. Clean the serving plate of any smears of chocolate with some paper towel. 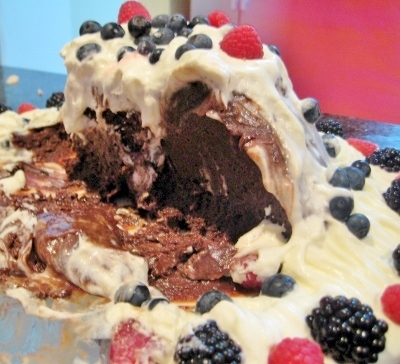 Decorate the pudding with the berries and keep in the fridge until ready to serve.